Rack of lamb is already one of the most tender meats out there, however it can be a bit more difficult to obtain a perfect temperature due to its varying size. Sous vide eliminates those grey bands of overcooked lamb on the outside and leaves you with a perfect medium rare chop. Simply set your sous vide machine to 132F for the best lamb you’ll ever eat – seriously, try this once and you’ll never cook lamb any way other than sous vide. Of course, once you finish cooking the lamb sous vide, you’ll need to finish it off with a quick hot sear. To do this, heat some olive oil in a cast iron pan on high heat and sear for about 1 minute. 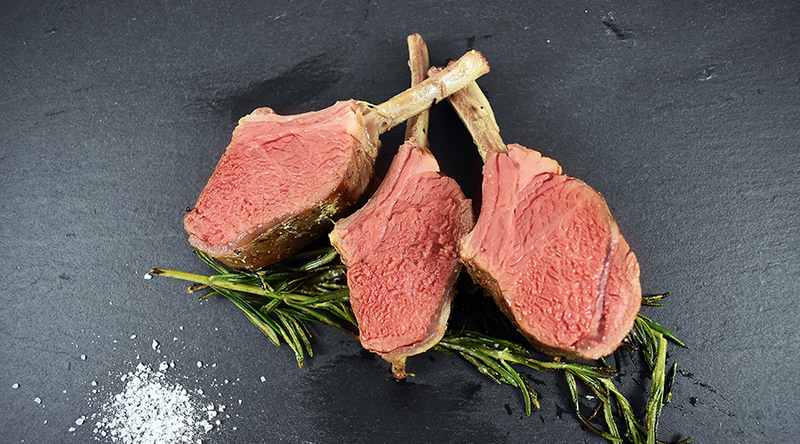 For added perfect, use a searing torch to get into the nooks and crannies of your rack of lamb. 1 (Optional) Marinate the meat for 24 hours prior. We typically just use salt/pepper, but do enjoy a nice rosemary balsamic marinade with it. 2 Pre-heat water bath to your ideal temperature (see chart on the right). We prefer 132°F which is on the high end of medium rare. 3 Generously season with sea salt, cracked black pepper, and any aromatics such as rosemary. 4 Vacuum seal your meat in a Vacuvita bag. 1 Place bagged rack of lamb in water bath and cook for 1 – 3 hours. 2 Remove it from the bag and pat dry with paper towels. 1 Pre-heat cast iron pan on medium-high heat and add avocado oil (or another high smoke point oil). 2 Sear lamb rack on hot cast iron pan for 1 minute, rotating every 15 seconds or so. Be sure to rotate the meat in order to get as much surface contact as possible. 3 Add butter and any aromatics to the pan for added flavor and crispness. Sear for an additional 30 seconds to 1 minute. 4 (Optional) Use a torch to get in the nooks and crannies of the lamb. Slice your rack of lamb after every 2 ribs with a sharp knife.